I’m so happy to say that all our September products are ready for purchase! I’ve been over the moon to see the response! I can hardly wait to see all the new little Shoppe themed projects that people all over the world create! I have customers in Italy, England, Australia, Germany, Mexico, Ireland, Japan, Hawaii, and Alaska….to name a few. You can view ALL the new goodies here! <—-there are 2 pages worth so look around! Most of our products are an INSTANT download, so that is instant gratification. Also our GALLERY is now LIVE! <—-We have a few tweaks to make to make it as user friendly as possible-like a NEW! Release folder, so that everyone can see all the latest and greatest projects each month 😀 So be on the look out for that as well. Don’t miss our GUEST DESIGNER CALL! Become a friend of MTME on Facebook–> HERE! Then submit a link to your creation on our FACEBOOK page < —-CLICK ME! under Guest Designer Contest Entry!! I will choose 3 designers on the 10th of September! Winner will be announced here on my blog, and on Facebook! Details will follow to the winning contestants. I am excited to see what you enter. OK lets get to the projects for today. You will want to stop by and see Katie Cotton today!! She has a fabulous project for you! From the moment i laid my eyes on the stamps being released this month, one caught my eye! A plane in the clouds! 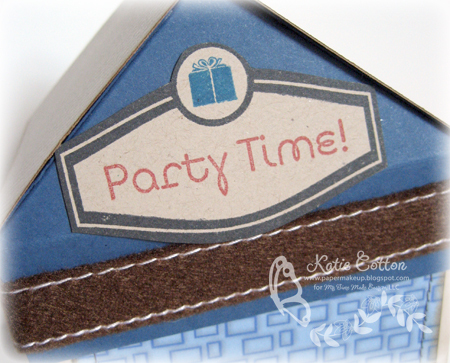 And with my youngest turning 2 in just a couple short weeks, i also knew that i wanted to create a boy party themed shoppe. To find out more visit Katie Cotton !Now it is MY turn to share. When I released my first little peek for the September Release, MANY of you speculated to the fact that this release was a “bird” theme. Many thought that the peek was a sweet little birdhouse. Obviously your inital thought was wrong, but still possible. I thrive on ideas, and you all got my creative wheels turning so no one would be disappointed. This was one of my SIMPLEST projects ever! Now you know that the Shop Around & Accessories Mega Template was designed so that you can make it into endless themed shoppe/house ideas, as our NEW! products will show you, and while none of them were specific to birds, you can still use the Shop Around & Accessories Mega Template to create your own stunning birdhouse gift box or home decoration! When creating my birdhouse I printed my Down to Earth paper first. I so love the design-which was created based on the Killer Curves flowers! So that set is a perfect match to this! I used the Custom Construction Material paper to create my roof pattern. The tag was cut from my Cricut. On it I used the Tending the Garden Stamp set, with the little bird from the Just For You set. My ribbon is from May Arts. The little bird peeking out is from Michael’s Craft Store! Isn’t is so pretty? Really makes this bird house theme a WOW! I even added little plastic bird eggs to the inside! Now for my birdhouse base, I recycled an old spool of ribbon!! I just covered it, and kept a piece of the ribbon on the sppol to coordinate my project 😀 (and hide the cardboard base!). I made a stand I simply scored some of the patterned cardstock every 1/2 inch, until I had a square “tube”. It is quite sturdy!! I can see this sitting as a centerpiece on tables at a Wedding all over the world! Well I hope you enjoyed the projects today. I have MUCH MUCH more to share so I hope you stop by again tomorrow. We still have a week of ideas left to share :DSee you then. 20 Responses for "For the birds….."
Absolutely stunning Lauren–and I love that new digi paper. Def. a must-have! Are you kidding me? This is so cool and so pretty! I LOVE it! What a great idea to use the spool of ribbon as the base! And the pole is just paper? Unbelieveable! You really hit it out of the ballpark with this one! This is unbelievably clever and cute!! Thank you for the inspiration. Sigh, this is so darned LOVELY!!!! Amazingly beautiful creation Lauren, you rock! Simply Chick and exquisite! You are amaxing Lauren. Since I originally guessed a birdie house of some type, this is amazing! I love it! It reminds me of one of my favorite grandmas that passed a few years ago, and I would totally make that for that reason alone…not to mention that there are a thousand other reasons! Nice job! oh my goodness – that little bird sticking his cute little head out from the birdhouse is the *cutest*… I bet you heard me squeal all the way from Michigan! Very cute, yet elegant. Definetly could see it used as centerpieces for a Wedding. Great job. This is FABULOUS. If this is simple, I’d hate to see hard. Just beautiful! Oh, this is just darling, Lauren! It might be one of your simplest projects, but my gosh, it is simply amazing!! You amaze me…if I could only come up with one of the amazing projects I would be so proud of myself. Wonderful project as always!!!!!!!!! way too cute, LOVE it! That is just so cute. I don’t know what to say. It is so stunning. I really love that amazing art work. I need to share this thing to my friends. I am sure that they will so surprise in this thing. Wow ,its cute .Love it !